In today’s political climate, where women’s rights are under attack, the International Socialist Organization (ISO) club feels this is the most pertinent time to organize a rally against The Bravo Center. 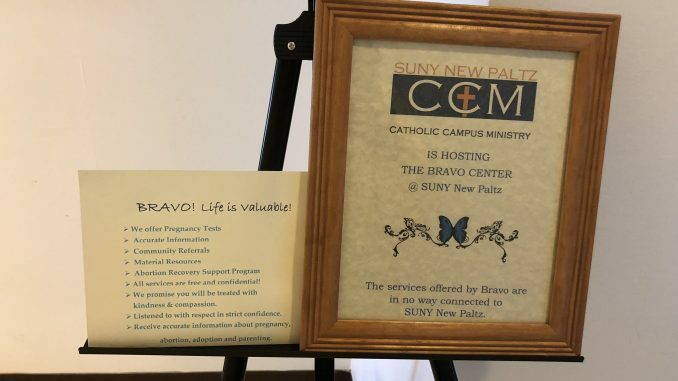 The Bravo Center, located at 246 Main St., claims to be a women’s health and pregnancy support center, but there have been several discretional allegations by women who went into the clinic and were falsely informed or given misleading information about their options. Fake women’s health centers are not uncommon in the U.S. In fact, the Charlotte Lozier Institute research committee estimates that there are 2,752 fake clinics across the United States. Which means, women across America are being shamed and misguided about their current reproductive-health-care options by these tax-funded clinics. When ISO gathered for their last club meeting, they took serious actions towards protesting The Bravo Center by proposing a rally on Friday, Oct.19 at 1:30 p.m. starting in front of the Humanities building. “We need to protest to make the case for having an action as opposed to waiting, and voting, or waiting and doing nothing,” said club E-board member Molly Seiden at their last meeting. The ISO, in their official press release, stated, “We are organizing to expose this fake clinic and demand the right to safe, accessible abortions. Crisis pregnancy centers are fake clinics that provide false information to pregnant people by posing as places that provide accurate information related to an unwanted pregnancy. The rally will also provide information about why these organizations exist, how to stop them and where to find the right healthcare. In preparation for next Friday’s protest, ISO will also be hosting sign making events open to the public on Tuesday, Oct. 16 at 6 p.m. in the Sojourner Truth Library lobby. For more information, contact hudsonvalleysocialists@gmail.com.